The Boone Central Bowling Club made their pin counts count Saturday. 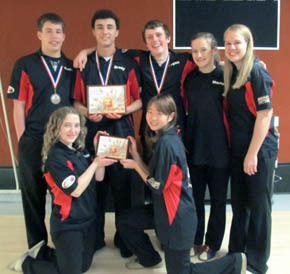 Led by individual champions Brody Kelly and Nathan Hemmer, the Cardinal boys won the C3 District title at Ravenna Sports Bowl and the BC girls finished runner-up, with four team members joining the boys as qualifiers for the Nebraska High School Bowling Federation state tournament. Boone Central’s boys rolled team games of 551, 601, 514 for a 1,666 total. In the Baker series, the Cards posted scores of 126, 127, 164, 116, 175 to finish with an overall pin score of 2,374. That was 24 pins ahead of runner-up Ravenna, the defending NHSBF Class C state champion. Chadron finished third. The Lady Cardinals put together opening games of 480, 541, 487 for a 1,508 total, which led Chadron by one pin. Boone Central’s Baker scores of 87, 101, 111, 131, 118 fell short, however, as Chadron rallied to take the district championship 2,082-2,056. Individually, Kelly and Hemmer tied for the C3 boys championship with series of 458. Kelly was the model of consistency, with games of 153, 155, 150. Hemmer rolled scores of 171, 154, 133. Logan Olson had a 407 series, with games of 132, 149, 126 to place sixth individually. Justin Rasmussen placed 11th with a 343 series on games of 95, 143, 105. Four Lady Cards placed in the top 10 at Ravenna and qualified for the NHSBF Class C state field individually. Mariah Patzel took third with a 415 series on games of 163, 148, 104. Saki Masuno rolled games of 113, 129, 156 for a 398 total and fifth place. Right behind was Jessica Tisthammer in sixth, with games of 98, 138, 124 and a 360 series. Shelby Schafer placed 10th, rolling scores of 106, 126, 103 for a 335 total.